Why didn't I think of this?! I've wasted so much money on safety pins trying to keeping my DDs from popping buttons. These shirts just might be worth every penny... and it's a lot of pennies. Sewn in our exclusive cool stretch cotton from our European mill. Our collars and cuffs will stay crisp, our shirts are long enough to tuck in and stay tucked in, and ours are decidedly feminine and lightweight. 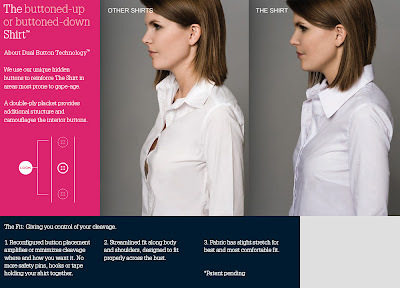 Oh, did we mention The Shirt won't gape at the bust? No wonder it's The everyday, everyway Shirt™.